A Minecraft-inspired sandbox simulation game that emphasizes survival aspects. It was developed by the independent developer Pathea Games and tells the story of a group of colonists whose ship broke down while landing on an uncharted planet. 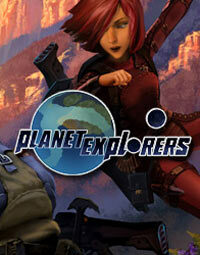 Planet Explorers for PC is a 3D adventure game concerning survival on an alien planet from the indie studio – Pathea Games, which drew inspiration from titles such as the renowned Minecraft. In the year 2287 the first colonial ship sets out from Earth to colonize the Maria planet, located in the Epsilon Indi system; unfortunately, during the landing sequence, a mysterious spaceship appeared in front of the human vessel, causing a massive equipment malfunction, which later is the cause of the ship’s destruction. Only several colonists manage to survive and reach the planet’s surface. Now they are forced to fight for survival in the alien, inhospitable environment overrun with dangerous creatures. The players play the role of one of the colonists, who reached the planet and is now in an extremely desperate situation; at the beginning of our playthrough we can choose the appearance and parameters of our character, which has direct influence on the gameplay. The fun itself comes down to exploring the new world, gathering resources, building and repealing the attacks of hostile creatures. The single player mode features a chain of storyline missions. The Pathea Games studio aimed to give the players as much freedom as possible, admittedly, Planet Explorers offers only a single map (with a size of 288 square kilometers); however, the game does allow changes to be made to the region in a variety of ways. Thanks to the complex system which allows us to influence our surroundings, we can construct structures, vehicles and even weapons; such assets are necessary if we wish to survive, as the Maria planet is crawling with monsters, animals and other hostile creatures. Planet Explorers for PC utilizes the Unity 3D engine, which guarantees good quality graphics, while also having quite low hardware requirements, interestingly, we can experience the action either from the TPP or FPP perspective. The developers have applied new methods of terraforming, based on the Voxeli technology. Expectations: 8.8 / 10 calculated out of 90 players' votes.